I only use the very best of pastels Sennelier Soft Pastels (I have 525 different colours of this type!) and Unison Soft Pastels. I class both of these manufacturers - as other artists like myself would - as being the "gold standard" of pastels. They have a high pigment content, are lightfast and are of exceptional quality. Soft pastels are richer in pigment than any other medium - for example; more so than watercolour, oil or acrylic paints. Pastels contain less binder - so a portrait produced with this type of pastel will be vibrant for many years. I also use Conte sticks (hard pastels) which are brilliant at the initial stage of the portrait when the artist is "setting the scene" and laying down the foundations of the painting. I use pastel pencils at the latter stages of the portrait, when fine details around the eyes and nose are to be "picked out". I sometimes undertake a portrait wholly in these type of pastel as the amount of fine detail obtainable with them is incredible! I use Carbothello pastel pencils, which are manufactured by Stabilo. 1 - Velour Paper by Hahnemulle (and other types of velour paper) - this has a beautiful velvet like feel which gives an overall softness to the portrait. It is ideal for any subject. The largest size I have of this type is 50 x 70 cm. 2 - Clairefontaine "Pastelmat" paper - this again has a soft feel, but has a very fine tooth - it has a cork-grained surface which takes many layers of pastel. The overall effects can be very fine detailed and crisp. It feels quite smooth to the touch. 3 - Sennelier La Carte Pastel - this again can produce a portrait of very fine, crisp and clear detail. It feels like a fine grained sandpaper to the touch. The largest that I have of this type of paper is 23 inches x 15 and a half inches. 4 - Other bases - I can also undertake your portrait on gesso (primer) primed canvas or board. I can gesso prime MDF boards; these can be cut to whatever size you require. For larger bespoke commissions this is a great option as it is more rigid than paper. I don't tend to use fixatives as the paper's that I use "grip and hold" the majority of the many layers of pastel that I apply well. If I do use fixative, then it is only to "set" the darker base colours firmly in place, afterwhich, the subsequent mid and light tones are applied with no extra fixative used after these layers. 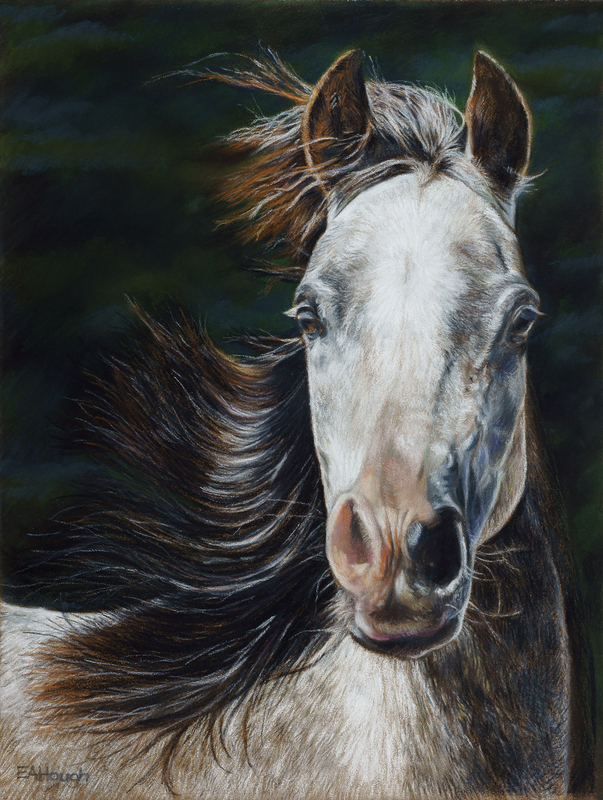 Artists such as myself tend not to apply fixative to lighter tinted pastels as they can be darkened and "dulled" by its application. The ideal way to protect a pastel original is to have it framed behind glass. This is the only way to preserve it in truth. Any pastel original must be "double mounted" - this is when a non-visible slightly wider mount is placed behind the visible mount on display in the frame. This technique protects the visible mount on show from any pastel "loss" - small particles of soft pastel that may drop from the portrait over time - any of this "loss" will be trapped inside the portrait on the non-visible mount. Another advantage of double mounts is that the portrait is further away from the glass. A lot of framers use special ultraviolet ray repellent glass. This minimises the risk of the portrait fading over time. As aforementioned, soft pastels contain a high pigment concentration so the risk of fade is extremely negligible. 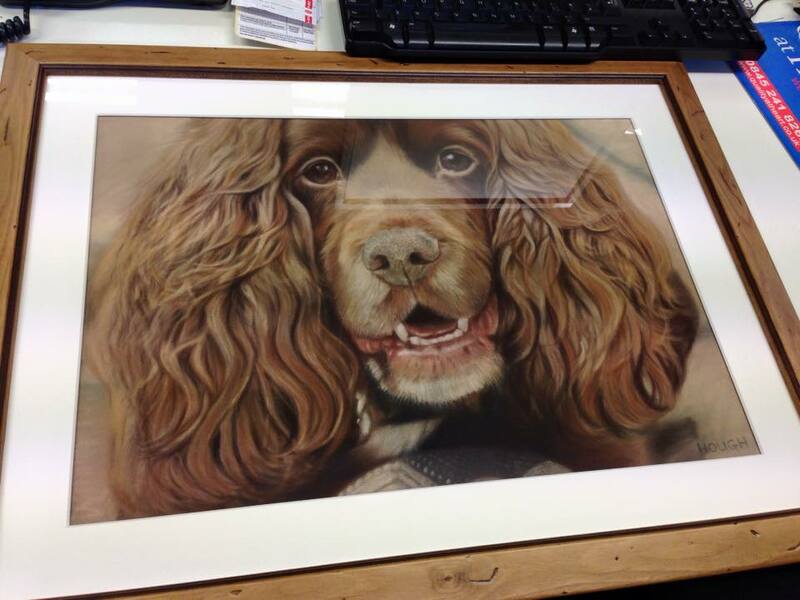 I can offer a framing service - at extra cost - and have a choice of frames to compliment your portrait. Please ask for details! This finished portrait commission is shown in the distressed pine frame option that I have available.